(45) Photos Printable Brochure Apply For Credit Schedule A Test Drive Text Us About This Vehicle! Is safety on the top of your list of MUST HAVES? 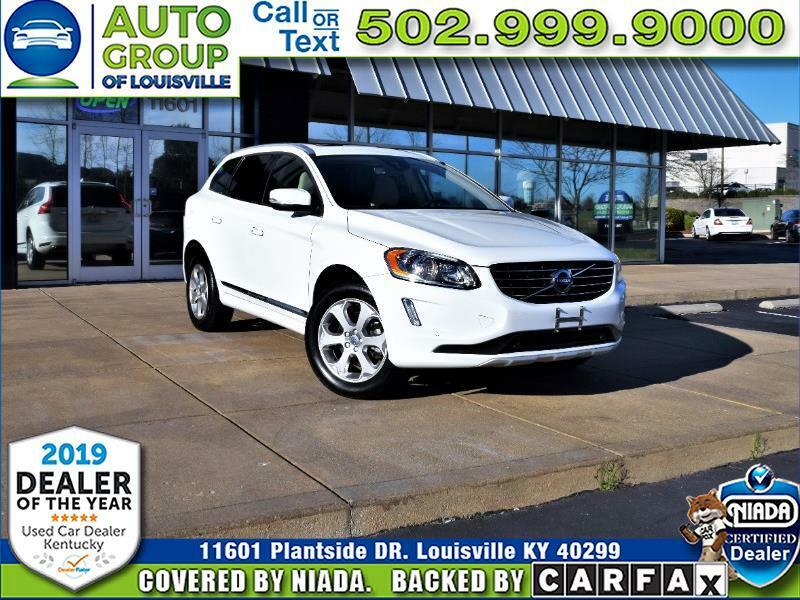 Then look no further than this 2016 Volvo XC60 from the safest car company on the road that just arrived here at Auto Group of Louisville. This fantastic XC60 is loaded with great features like Heated Seats, Heated Steering Wheel, Heated 2nd Row Seats, Panoramic Moonroof, Navigation, AM/FM/HD/XM/Bluetooth/CD Informant System, Dual Climate Control, Front and Rear Parking Sensors, LED Daytime Running Lights, Keyless Entry and Go, Memory Seats, and much more. Why are you still sitting there reading this? You should already be heading to 11601 Plantside Drive in beautiful Jeffersontown Kentucky and letting one of our Great, Friendly, Knowledgeable Customer Care Specialist show you this incredibly safe and beautiful Volvo XC60 now. DealerRater's CAR DEALER OF THE YEAR 2019! Cargurus' TOP RATED DEALER 2018! DealerRater's CUSTOMER SATISFACTION AWARD 2019! BEST PRICES IN 200 MILES! CALL OR TEXT US, 502-999-9000! We are a family owned and operated dealership. Our caring staff will help you find the perfect car, truck, SUV or minivan to meet your needs. Your happiness is our passion! We work with over 15 Lenders, banks and credit unions, to find you the best rate and payments for your individual situation. All credit is accepted: No credit, Bad credit or Good credit!!! An array of products are offered to protect your investment and your finances for years to come, in the way of Extended Service Policies, Total Loss Protection, Tire & Wheel Coverage, etc. at prices to fit any budget. All of our vehicles have been researched and strategically priced, to be the most competitive in the market, based on the Mileage, Condition and Options of each vehicle. Because of this our customers come from all over the US. We have already done the shopping for YOU our Customer!!! If one of our vehicles happens to be above the NADA or Carfax Booked prices, it is only because of it's Uniqueness and or Scarcity in the Marketplace. Which means we have paid more of a premium price ourselves to be able to offer this vehicle to you. We know you don't want to play games when shopping for a new car and we agree. Other than Military Discounts, our Initial Visit Incentive (IVI) Program, or other occasional programs, our website shows our best prices. We serve Louisville, Radcliff, Jeffersonville, New Albany, Clarksville, Frankfort and Lexington. Have fun shopping for your next car!!! Visit Auto Group of Louisville online at autogroupoflouisville.com to see more pictures of this vehicle or call us at 502-999-9000 today to schedule your test drive. Message: Thought you might be interested in this 2016 Volvo XC60.